Snakes are purely carnivorous animals that feast on a variety of foods, depending on their size and environment. 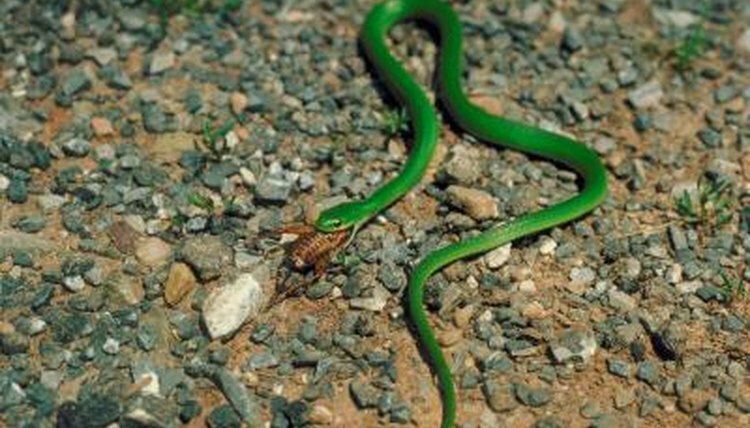 Small prey are swallowed without much work on the snake's part. Larger prey are either injected with venom or crushed by the snake's muscles before consumption. While rats are a popular food source for some snakes, snakes will eat what's available to them. Other rodents, besides rats, are a common food source of many types of snakes. Mice, for example, are often fed to pet snakes, such as pythons, because they are a nutritious and inexpensive food source. If you don't like the idea of feeding your snake a live animal, you can feed your pet frozen mice that have thawed. Snakes are notorious for eating chicken eggs. Eggs are a good source of protein for the reptile and are usually easy to sneak from a bird's nest, especially if the snake is large enough to intimidate the bird into leaving the nest. Fish eggs are also a food source for water snakes. In some cases, a snake doesn't have to worry about chasing the bird away from the nest. Snakes that are large enough to ingest a bird can easily kill the parents and then eat the eggs. Larger birds, such as chickens, can be a food source for snakes large enough to coil around the bird. Baby birds are another easy meal. Water snakes also eat a variety of fish, ranging from small minnows up to large bass, depending on the snake's size. It's a snake eat snake world and larger snakes are known to eat smaller snakes. They are also known to eat lizards. Snakes that are referred to as king snakes, such as the king cobra, dominate and eat other snakes. Larger snakes that have the venom or muscles to take down larger animals will. For example, the green anaconda is known to feast on pigs, which it crushes to death in its massive coils before consuming. Large snakes will eat everything from cats to dogs. It just depends on what's available to them. Macro Evolution: What Do Snakes Eat? SZG Docent: What Do Snakes Eat?